To each of us is given the occasional burning bush or mountain top experience. Sometimes we don’t even recognize it but other times we feel a deep shift deep in our soul. I am not even sure we have to be attentive. Most often they just happen and we are surprised but we know it is of God. My husband Claude wanted to go to his home parish today. I didn’t. Something was pulling me to St. Thomas’ in Sanford or St. Mary Magdalene’s in Seven Lakes. Up until the last minute I didn’t know which way my car would go ~ north or south. There was some freedom in going wherever the Spirit led me. To make a long story short, I went south to St. Mary Magdalene’s not knowing that they were celebrating their 30th anniversary, not long in the Episcopal Churches’ history in North Carolina. Emmanuel is well over 100 years’ old and St. Thomas’ is even older. But this sweet-spirited mission church is committed to growth and to serving God by serving others. What came as an even greater surprise was Father Bob’s sermon. 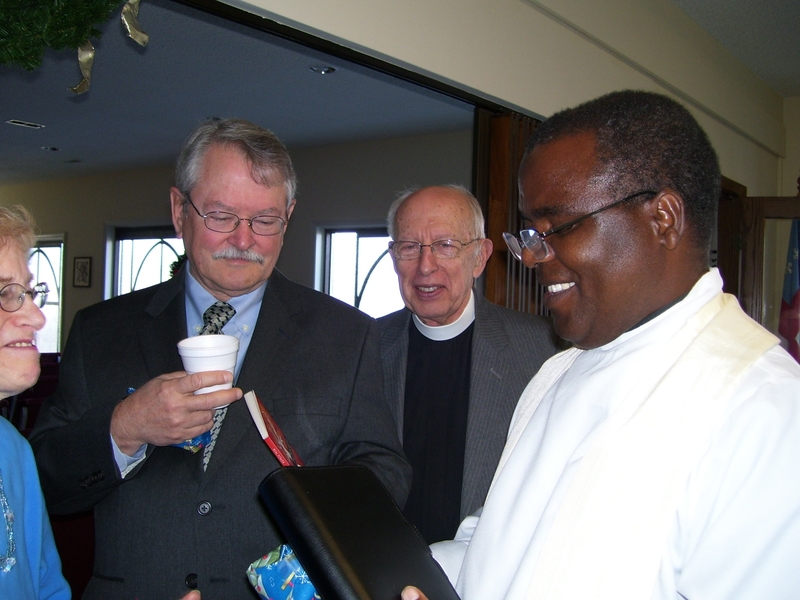 He spoke lovingly of The Reverend Moses Matonya’s visit to St. Mary Magdalene’s last Sunday with his message of “love and thanksgiving.” Bob also read an e-mail to Jessie and me from Moses written when he reached Virginia Theological Seminary last Sunday evening. When he arrived they had already eaten their evening meal but Moses had in his possession a small gift given to him by someone at St. Mary Magdalene’s ~ something wrapped in blue paper that he clutched in his hand as he signed his book and as he talked at their Coffee and Contemplation time after the service. None of us, other than the giver knew what was in the small package. Moses wrote: “Thanks be to God because I have the cake I was given at the church I am eating it before I go to bed.” He closed his e-mail with these words: “I truly enjoyed so much my stay with you. You have so nice hearts you ladies and God bless you richly. You will always remain in my heart and I will NEVER EVER forget the care and love you and your people (St. Mary Magdalene) gave me.” Bob said that a simple gift of cake, wrapped in blue paper became Moses’ Sunday supper and that God’s grace transformed that tiny gift into an abundant meal of love.” He went on: “Can’t you just see Moses’ smiling face as he ate his gift of love, and remembered with fondness and thanksgiving the people of St. Mary Magdalene Church? Can you have any doubt that God was smiling too? Can you ever doubt that God was well pleased?” By then tears were coursing down my cheeks; Bob was crying and the congregation was in the same boat. We all felt the grace of Moses’ visit. After the service Bob said to me that now that Moses has gone from this place that it is not unlike the lovely fragrance of incense after it has burned out when there is nothing left but ashes. That is the way we feel about Moses Matonya. His loveliness is still here with us. 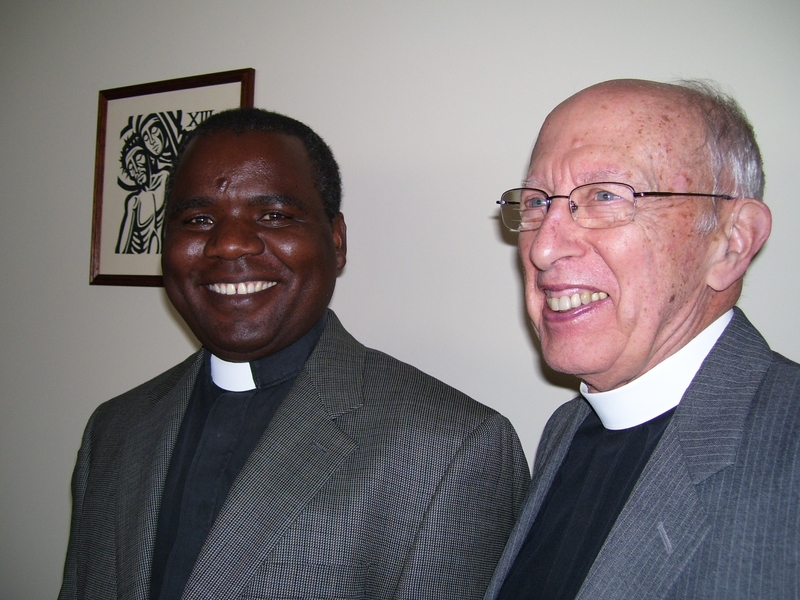 I am deeply moved by his visit, his faith, his trust and his way of always finding reason to give God thanks. I learned later this afternoon that due to heavy rains the young sister of Seche who cleaned, washed and baked bread for Jessie and me lost her home yesterday when it collapsed due to heavy rains. 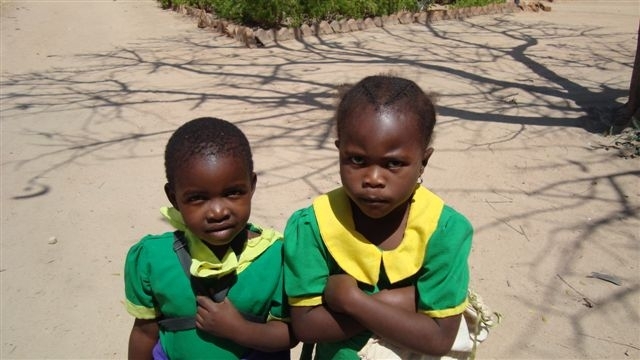 Pendo which means love in Kiswahili has two small children and I want to help her in any way we can. She works for Sandy and Martin McCann. If any of you readers would like to help don’t forget Karimu. We will see Sandy next week just before she returns to Tanzania. We will give her what we have to aid this young and good family. Rain is fickled over there ~ it is not enough or it is too much. Even so I am sure Moses will give thanks to God.